A look at the charts of the indices will clearly show that price action is exhibiting a volatile, trendless state. Short signals were briefly given on some indices, which have been rapidly reversed. This price action is similar to that in November 2012, when there was a 'V' shaped reversal in the markets. 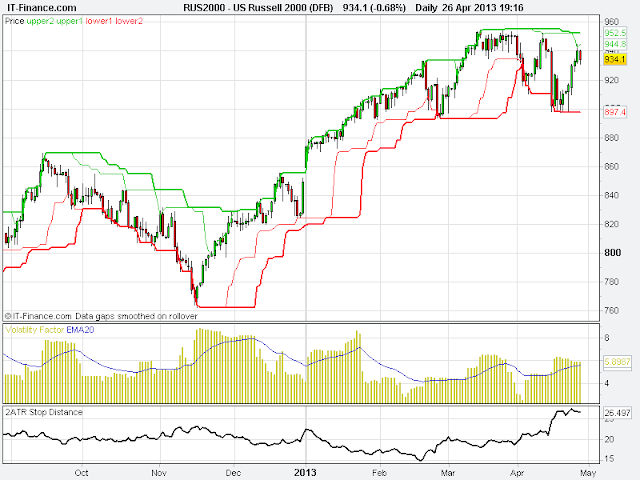 Below I've shown the current chart of the Russell 2000 as an example. Yet again, I find myself in the position where I am very lightly invested, and (subject to gaps through my stop levels) I have no cash equity at risk. There have been very few setups I have liked the look of in recent days, and the scans I use have also come up with few ideas. In markets such as these, remember that staying in cash is a position that is available to the individual trader, which may not be available to a hedge fund manager. You do not have to be fully invested in the market, all of the time. Plating the markets is a question of playing when the odds are in your favour, and at the moment, the prevailing market conditions are not helpful to a trend follower.